A lot of ignorant social media commentators are beating up on the Nigerian Senate for passing “Bill Number 8,” which grants legislative immunity to members of the National Assembly. One social media commentator cynically called it “legislative impunity,” and he was barracked by a band of nescient cheerleaders. The truth is that legislative immunity, also called parliamentary immunity, exists in all modern democracies, as I’ll show shortly. Contrary to what most people imagine it to be, legislative immunity doesn’t mean freedom from consequences for crimes committed while serving in the legislature. It merely means legislators can’t be sued for libel or slander for things they SAY when the legislative bodies they are members of are in session or when they are in committee meetings. They are not shielded from prosecution for other legal infractions they commit in and outside the National Assembly. There is no modern democracy in the world that doesn’t have it. In the UK, Canada, and other Westminster systems, it’s called “parliamentary immunity.” It protects members of parliament from being sued for libel or slander for things they say while the parliament is in session. In France, it’s called parliamentary “irresponsibility.” Note that “irresponsibility” has a completely different meaning in French; it means freedom from consequences. French parliamentarians have freedom from legal responsibility for whatever they say in the course of their parliamentary duties. In the United States, members of Congress, including state legislatures, also enjoy absolute privilege to say anything while Congress is in session without legal consequences. I can go on with more examples, but the point I want to call attention to is that legislative immunity isn’t some outlandish or uniquely Nigerian contrivance. It is part and parcel of the architecture of modern liberal democracy. Although it can subject to abuse (which is why Germany, for instance, makes exceptions for “defamatory insults” against Jews), legislative immunity allows legislators to debate robustly and investigate the executive unburdened by the dread of frivolous litigations or executive harassment and intimidation. It can also be used to subvert tyranny. Helen Suzman, a white anti-apartheid South African parliamentarian, used the cover of legislative immunity to call attention to the horrors of racially motivated violence against blacks, which the press was forbidden from reporting. Babachir David Lawal’s grass-cutting scandal, to give just one Nigerian example, was brought to light by the Senator Shehu Sani-led “Senate Ad hoc Committee on Mounting Humanitarian Crisis in the Northeast.” If Lawal was halfway smart, he could have exploited the lack of legislative immunity for senators and sued the senate committee members for “libel” (even when nothing libelous was said against him) and stalled their investigations with what lawyers like to call vexatious litigations. In the United States, legislative immunity also extends to everyone who appears before Congress— or any congressional committee—to provide oral testimony during a hearing. So, for instance, a contractor or government official invited to testify against Lawal could not be sued for libel—or fired from his job— for whatever he said against Lawal— or anybody— during his testimony while the Senate committee was in session. This is intended to guarantee uninhibited flow of information in legislative, investigative, oversight, confirmation, ratification, and field hearings. That’s why American scholar George G. Galloway described congressional hearings as a “goldmine of information for all the public problems of the United States.” It can be for Nigeria, too. Legislative immunity falls under the broad rubric of absolute privilege in English and American law. Absolute privilege guarantees certain government officials immunity from legal consequences for actions they take or things they say in the course of their official duties. Police officers, for example, enjoy absolute privilege in the course of their official duties. If they, for instance, accuse someone of theft and it turns out that they were wrong, they can’t be sued for libel. Judges also enjoy absolute privilege, as do lawyers and witnesses who argue and testify while the court is in session. There is also an ancillary component of absolute privilege in English and American law that I am not sure the Nigerian version of legislative immunity has addressed. It is called “qualified privilege,” which is often extended exclusively to news reporters. It means reporters can also not be sued for reporting exactly what people with absolute privilege (including legislative immunity) say in the course of their official duties. Helen Suzman used her parliamentary privilege to allow South African reporters to report on issues the law forbade them from reporting. “Qualified” here means limited or restricted, and implies that should reporters add to or intentionally contort a statement that someone with absolute privilege makes, they are not immune from the legal consequences of their reportorial indiscretion. “From the outside looking in, the vast majority of National Assembly members come across as brain-dead, monomaniacally mercantile knuckleheads who have no business being in the business of lawmaking. This is, frankly, a regrettable thing to say because there are a few truly honorable, clear-headed men and women in the National Assembly. But it’s difficult to ignore the huge joke that the National Assembly has become. “If National Assembly members are not exchanging fisticuffs over inanities—like hyperactive, ill-bred high-school kids—they are arguing interminably over unearned perks and over who chairs cushy, ‘juicy’ committees or leadership positions. If they are doing none of the above, they are luxuriating in sybaritic lavishness…. “Perhaps the lowest water mark yet in the show of brainlessness by the National Assembly happened a few days ago when 5 senators and 20 members of the House of Representatives constituted themselves into an ad hoc committee of bodyguards around Mrs. Toyin Saraki when she was invited by the Economic and Financial Crimes Commission (EFCC) to answer questions over allegations of corruption against her…. 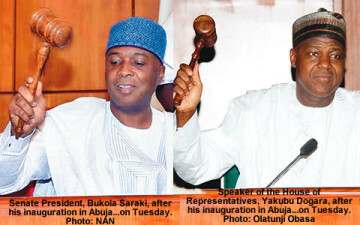 Nonetheless, it is also true that the National Assembly has become the convenient bogeyman of the disgustingly contemptible and vile hypocrites called “Buharists” whose favorite pastime now is to blame the Buhari-inspired dysfunctions in the country on the National Assembly—and to instinctively criticize everything the National Assembly does while turning a blind eye to the spectacular “ungovernance” of the presidency.